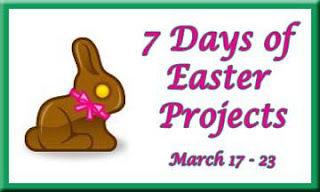 Welcome to Day 7 of the 7 Days of Easter Projects! The links to all participants are located at the bottom of this post... please leave comments if you have some time to show these ladies some love ;) And THANK YOU to our fearless leader Donna, who has organized this for all of us! Nothing is better in an Easter basket than homemade cookies (no matter how good those Robins Eggs are). Wrap them up in a clear cello bag and add a handmade tag. Aw lookit dat wittle kangaroo baybee! This card will also be entered into the Lawnscaping Challenge: Stitching and the Moxie Fab embrace the negative challenge. materials: Lawn Fawn 'Critters Down Under', Copics, Memento ink 'tuxedo black', October Afternoon 'Cakewalk' pattern paper, Spellbinders 'label 4' die cut, we r memory keepers twine, foam adhesive. Be sure to check out the other projects from this amazing line up! AND there is a Pinterest board with ALL of the projects from this week. It is filled with pretty things and definitely take a peek and follow the board! Love your yummy & sweet projects. That tag is fabulous! The stitching as part of the frame is awesome! And fantastic coloring! sooo cute.!! lovely frame.. adorable scene that pop out of the frame...!! Thank you for playing with us at Lawnscaping..!! Aww so cute!! Love the little scene, the window and the random stitches! Yum, I want some of those cookies now!! LOVE the tag - must get those PTI stamps. 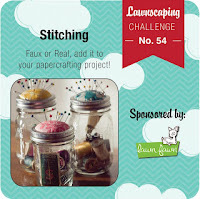 That baby card is adorable - the stitching is super cute!! such a cute card! the random stitching is so homespun and soft looking. Thanks for playing along with us at lawnscaping! the coloring along with the window shows such a labor of love. I especially like the x stitches as embellishments!